I had a craving for amaranth porridge last week and hadn’t made it in a while, so I whipped this up one morning and it was so tasty I had to share it here. 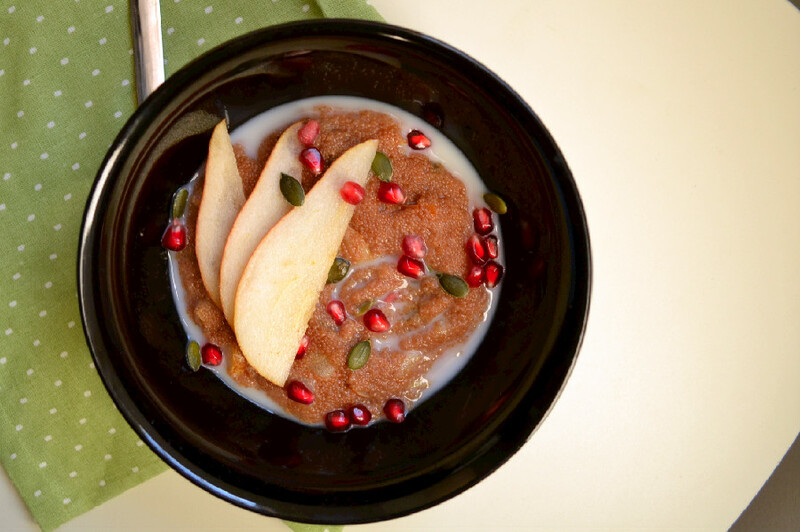 It makes use of seasonal pears and pomegranates and its spiced to perfection with cardamon, ginger, nutmeg and cinnamon and tastes just like autumn in a bowl. Pears are wonderful this time of year. I love how they can be firm and crunchy like apples, yet juicy like a peach at the same time. They’re naturally sweet, yet relatively low on the glycemic index, are a great source of fiber, and a good source of other vitamins and minerals like Vitamin C and K, and copper. Here I’ve cooked them into the porridge and used them raw as a garnish. Best of both worlds. Add amaranth and water to a pot and bring to a boil. Reduce heat and simmer uncovered. After about 15 minutes, add the pear pieces and spices and continue to cook for an additional 10 minutes, on low heat, stirring frequently until it thickens. 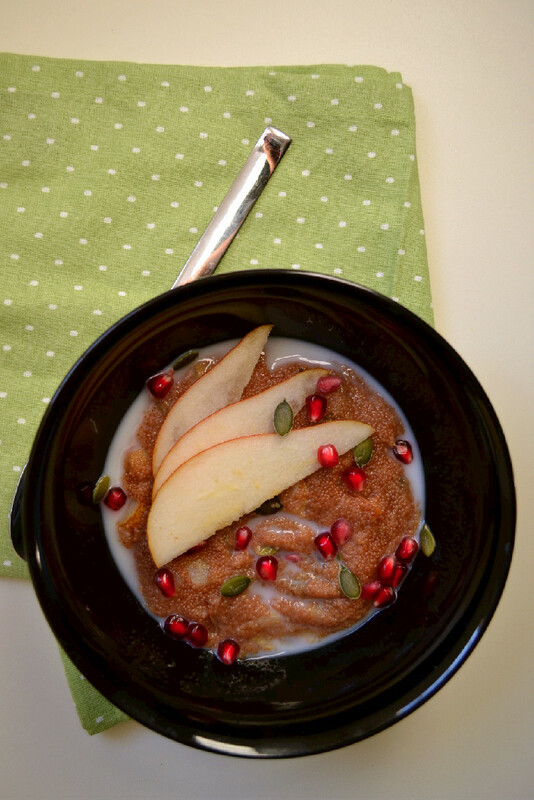 Stir in pomegranate and pumpkin seeds. Remove from heat, transfer to bowls and garnish with maple or brown rice syrup, pumpkin and pomegranate seeds and plant milk to taste.